With Game 1 well in the past, we look ahead to tonight's Game 2 in San Antonio, where the air conditioning will in fact be fully functional. That means that there won't be any off the court factors affecting the game, so it's time for four (hopefully more) quarters of pure basketball. We won't have to deal with star players being too exhausted. We hopefully won't have to deal with people's legs deciding not to move. After dropping Game 1 at the end, I expect to see Miami open up Game 2 but like they did in the opener, and play fast and aggressive, to much success. They'll be running early and often in transition, led by LeBron James, who should be well hydrated, and full of potassium in time for tonight's game. I have no cramping concerns for him this time around. In fact, I see quite the opposite happening. After being absolutely crushed in the media ever since Thursday night, I truly think that we're in for a treat as the best player in the world should come out of gate angry and determined. He'll be attacking the rim and really challenging Splitter and Duncan's ability to challenge drives. This also means that Miami's outside shooters should be playing important roles, because if James isn't able to score at will, he will be able to find guys like Ray Allen and Rashard Lewis ready to jack up some shots. Danny Green will not be able to take over the game like he did in the fourth quarter of Game 1. 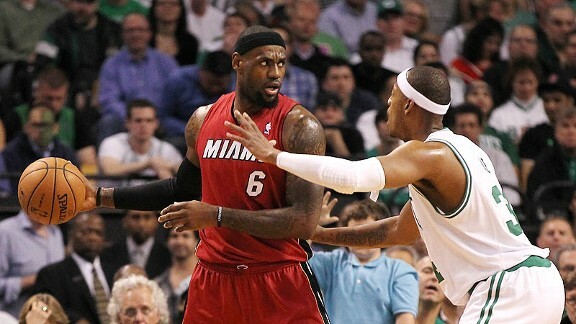 I believe the only reason why that happened is because the Heat defense was discombobulated sans LeBron. The perimeter defense should be a lot more solid this time around. The Heat will win and even things up thanks to an almost legendary game by LeBron James. A triple double will be in the making.